In the creepy half century old cycling training slash horror film, we learn that any small mistake whilst riding your bike will be rewarded with maiming or death. Fifty years later, the perception that only one in eight monkey children will return unscathed from a spontaneous ride to the park is more pervasive than ever, and the younger generation is being robbed of the freedom and independence that bikes afforded their parents’ and grandparents’ childhoods in the name of averting statistically insignificant risks. Much of North American society continues to try to box in cycling as a recreational activity that requires special equipment and a designated place to ride, rather than an activity which can be both utilitarian and fun that can occur in any public (or private) space. This has resulted in the continued preoccupation with road and mountain bikes, racing gear, gram counting, spandex, Strava, etc. For someone who’s more interested in getting from point A to B cheaply and efficiently while fully participating in her urban community, it means I am really not interested in a significant segment of cycling culture. 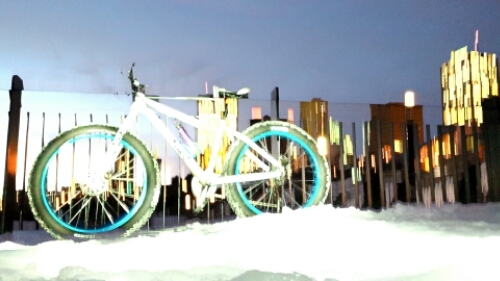 So, I got a fat bike. The day after it was delivered it snowed heavily, and I had to ride across town. 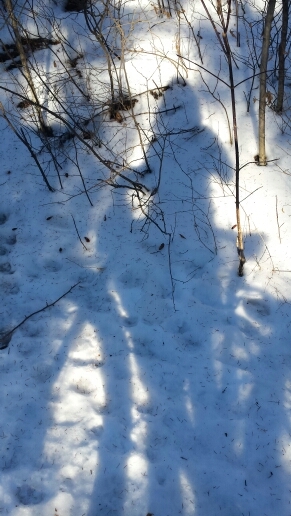 Like many winter bike commuters, I have enviously scoped out the fat bike jockeys effortlessly riding through heavy snowfalls and sketchy street clearing, outpacing car and bicycle alike. To my astoundment, I got to my destination early that day, clocking a summer time in the middle of a winter storm. 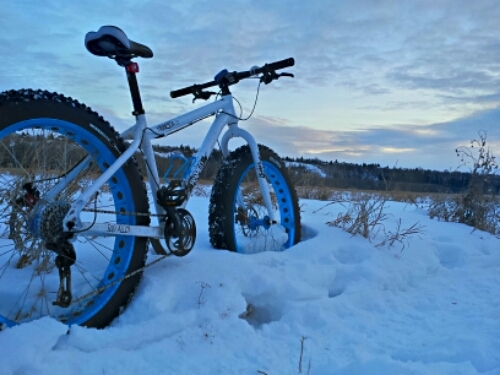 The fat bike is a game changer for commuting on heavy snow days, but even in the northern outpost of E-Ville, those days number only a handful. As much as we like to complain about snow clearing, everybody is usually moving normally within 24 hours of a storm because it’s winter and we’re used to it. Most of my winter commuting is done on either packed snow or streets where the friction of car tires has sublimated the snow to the bare asphalt. 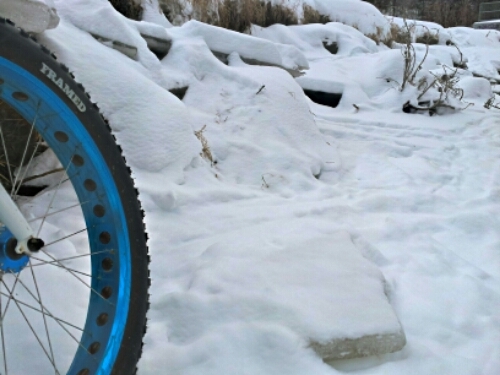 When that packed snow gets icy, the fat tires that float so well over the loose stuff easily lose traction, while a narrower studded tire provides far more stability. On the bare pavement they drag as if you were riding on water balloons. When riding on the streets, I find myself seeking out the bumpy, cookie dough conditions I used to always avoid on the residential roads, alleys, between the tire ruts, on the shoulders and filling the painted bike lanes. I didn’t buy this bike to commute on, though. I bought it to have fun on, to explore the great trails of this city’s valley and ravines, to get off the well trodden path, to rekindle the joy of cycling. And I’m not the only one. I was floored to find that the city is even giving consideration to winter trail riders. 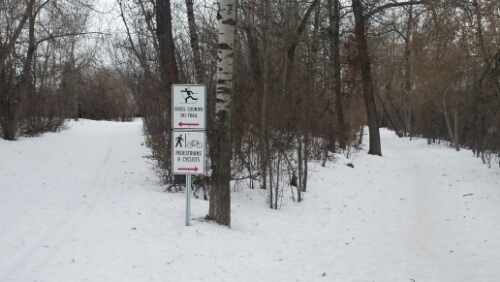 In summer, this ski trail is the bike path, with bikes not allowed on the walking trail on the right. There is also no way these paths would be used for commuting/transportation, as they only connect two river valley parks in a roundabout way. This is purely for enjoyment and exercise. Having never owned a mountain bike, if I felt the desire to go off the beaten path, I’d usually make do on a hybrid, or take a hike. The last few years, however, between a chronic back problem that can make it difficult to walk and a growing interest in road and city bikes, I was losing touch with the wild places that nourished my soul. 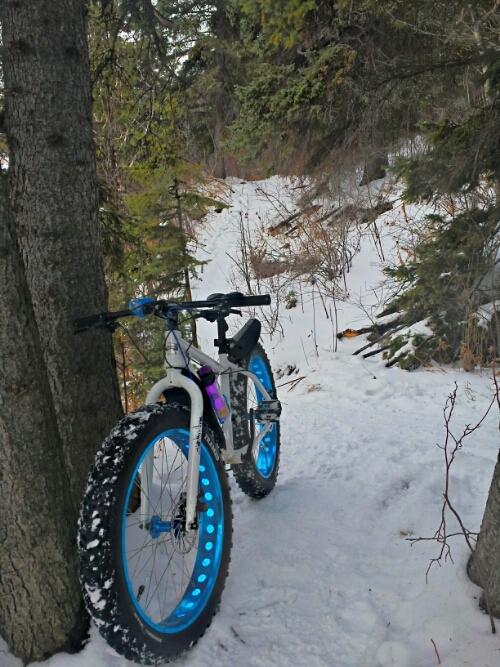 This bike has opened up the extensive river valley and ravine trails and taken me places I’ve never considered riding before, especially in the winter. The day I took a ride down Mill Creek, on Mill Creek. 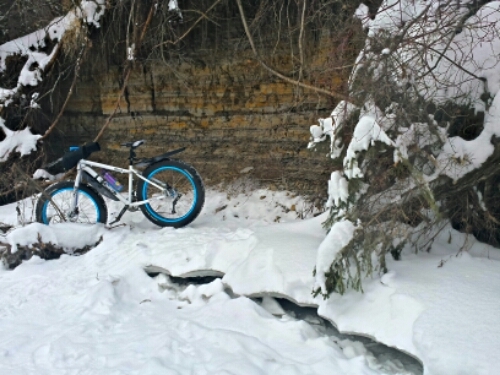 Taking a ride down the creek, on the (frozen) creek? Yes please! It was one of my highlights of the season. The eight weeks since I got this bike have flown by, and have marked a pronounced change in my attitude towards winter. Between getting excited for fresh snow and secretly wishing for a late spring, the fat bike is a game changer for this winter cyclist. 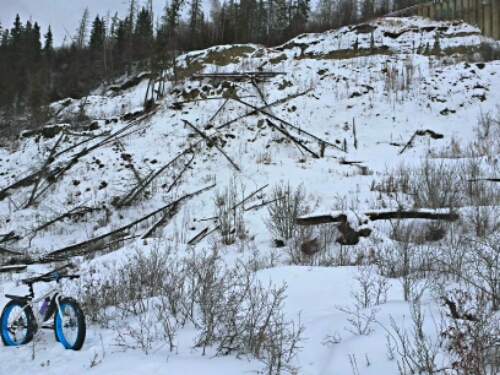 It’s too bad that most of the fat bikes currently being sold will just be loaded up into pickup trucks to be driven to an “appropriate” trail because they present an opportunity to make your own trail and reinterpret your surroundings from a completely different perspective.